The internet’s capability to turn striking visual images into widely circulating memes has forever changed the status of poster design. Consider Shepard Fairey’s famous poster, “Hope“, featuring Barack Obama, which managed to effectively become a major campaign asset despite never securing Obama’s approval (or that of Getty Images, which owned the source photograph). It was the “Keep Calm and Carry On” poster, however, that inspired this blog post. The design, which consists of these words in a sans-serif column beneath a crown, typically on a monochrome background or before a Union Jack, has become a ubiquitous fixture in hipper scenes. Not everyone, however, seems to be aware of its origin: a motivational poster produced by the British government in 1939, meant to buoy civilian morale amidst devastating German air raids on London (it was never actually distributed, however, until being rediscovered in 2000). That an artifact of such historical gravity, associated with such trauma, could be emptied of its meaning and distributed as a trendy wall decoration is certainly upsetting, but it did get us thinking about the many other famous posters we all know and what their own historical origins might be. You might be surprised by some of them. Although this illustration by American founding father Benjamin Franklin was printed as a political cartoon well before the existence of the modern-day poster, its function was similar. Its message was that the American colonies must unite if they wish to successfully fight the British for independence – a bit of propaganda and a memorable image to mobilize it. Indeed, the image became so iconic that it continues to appear today on media that Franklin probably couldn’t have imagined (unless he was into house parties and skateboarding). Late 19th century Europe witnessed the emergence of graphic design as we know it today, and along with it, the modern poster. Art Nouveau artists like Alphonse Mucha put their beautiful illustration skills to work for advertisements for luxury goods – especially liqueurs like absinthe and vermouth. The posters feature boozy pre-Raphaelite women and devious gremlins in more or less equal number. Americans are most familiar with Uncle Sam (below), our star-spangled military recruitment figure. But in fact, the iconic representation of Uncle Sam with his authoritative forefinger was modeled after a World War I recruitment poster from across the pond, featuring Great Britain’s famous Field Marshal Herbert Kitchener (above). Here are a few other posters that were designed to enervate the American populace about getting involved in the European war. During the Great Depression of the 1930s, the Franklin D. Roosevelt administration established the Works Projects Administration with the hopes of stimulating the economy by creating work for people, including artists. One of the most beloved products of the endeavor is a series of prints designed by graphic artists, promoting tourism to the United States’ national parks. The emergence of high-quality, portable cameras ushered in a whole new type of poster: the amazing snapshot. In the above image, a line of construction workers break for lunch on a cross beam high atop the skeleton of the RCA building in New York’s Rockefeller Center, during its construction in 1932. No, that is not Photoshopped. This gem allegedly came into being after a conference at which Einstein spoke. Tired and annoyed by photographers who kept asking him to smile for their cameras, the father of modern physics stuck out his tongue instead. This famous embrace occurred during a parade in Times Square celebrating the announcement of victory in Japan and the end of World War II. Rosie the Riveter easily ranks among the most famous poster incarnations. This fierce lady inspired American women to contribute to the war effort by working in munitions factories. Pin-up girl posters, featuring women in varying degrees of undress for the titillation of male buyers, have had a fascinating evolution. They came into existence toward the end of the 19th century along with the rest of mass-producible media. They took the form of both photographs and illustrations – the most noteworthy (and scandalous) of which we owe to the artist Alberto Vargas – until the 1950s, at which point photography became their predominant medium. Real life icons like Marilyn Monroe have served as pin-up girls, most famously in the above film still from The Seven Year Itch (1955), but so have fabricated advertising creations, like the Coca-Cola girl below (1946). This photograph of The Doors’ Jim Morrison became iconic after the rock star’s death, which was allegedly the result of a heroin overdose. He was one of many counterculture figures from this decade to receive iconizing treatment. The below images of Argentine revolutionary Che Guevara, folk singer Bob Dylan, and the Rolling Stones are all dorm room staples now. Poster: Che Guevara Red by Jim Fitzpatrick (via Wikipedia). Based on Alberto Korda’s famous 1960 photograph. Poster: Bob Dylan’s Greatest Hits (via Milton Glaser). Inspired by a Marcel Duchamp self-portrait. 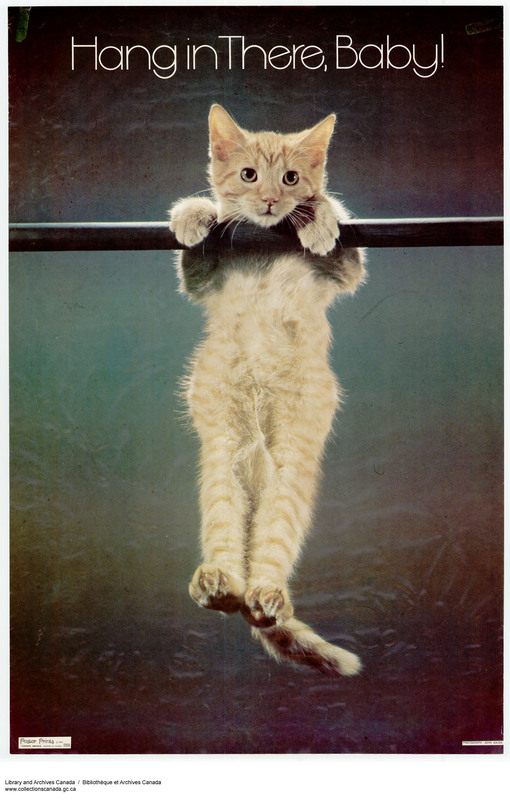 For some reason, a kitten clinging to a clothesline became a motivational poster phenomenon. Indeed, when American vice president Spiro Agnew was being pressured to redesign because of tax evasion and bribery, a group of his supporters famously presented him with the image. As a form of cheap wall decoration, the poster has found one of its primary homes in college dorm rooms. Not surprisingly, then, a vast number of college-oriented posters, often glorifying binge drinking, have come into being. The above mock-vintage beer ad and film still from Animal House (1978), featuring Jon Belushi chugging a bottle of whiskey, are ubiquitous fixtures in fraternity houses across the country. Poster: “Hope” by Shepard Fairey (via Wikipedia). Based on the photograph by Mannie Garcia. Few posters in recent history have had the impact of “Hope,” designer Shepard Fairey’s red, white and blue treatment of a photograph of Barack Obama that circulated widely before the politician’s election in 2008 (and also landed the artist in some trouble with Getty Images, which owned the copyright to the source photograph). As with many of the famous posters included above, it has spawned a vast progeny of spoofs, like the one below featuring the protagonist of cult film The Big Lebowski (1998). We leave you with The Dude. Are there any more famous posters that we left out? Please share! Great article. Loving the ‘See America’ series. Hopefully this will be an iconic poster when it comes out, copyright 13/10/2015. Will this be on a list in 50 years time? I wonder, what do you all think of this design?